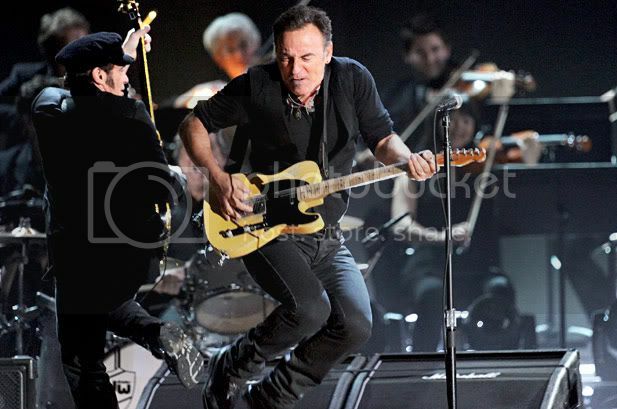 Bruce Springsteen resumes his trek across Europe on the Wrecking Ball world tour, stopping tonight in Milan, Italy. We have good news and bad news in this one and we're going to be positive on this Thursday and start with the good. This is now the longest set of the entire tour coming in at 33 songs strong. The good is "Candy's Room" and "The Promise," the latter performed solo piano. The good includes "Spirit In The Night" and "E Street Shuffle" played back-to-back. Good also includes "Darkness On The Edge Of Town." I also love seeing "Cadillac Ranch" in the encore. "The Promise" is followed with "The River," "The Rising," and "Radio Nowhere," which is an excellent suite of songs. There were several bowls of good poured out upon the fair people of Milan, Italy before they were doused with the bowls of Bruce's wrath. Not only did he insist on playing "No Surrender" but the legendary E Street Band, according to various internet reports, fucked it up twice before getting it right the third time. No, I mean fucked it up beyond the decision to play it. Maybe it was a mutiny. I'd like to think so but the time to do that is when Bruce brings a kid on stage for "Waiting On A Sunny Day." "No Surrender" is weapons-grade bad, "Waiting On A Sunny Day" is a warcrime. At any rate, the poor people of Milan had to wait for the E Street Band to figure out how to play a song Bruce has been overplaying since the flood and then were subjected to "Working On The Highway." "Bobby Jean" was a depraved act by a depraved man. I know there are those of you who find yourselves tired of my bitching about turds in the setlists and wish I'd sit down and shut up. My response: I wish he'd stop playing turds. Bluntly put: I'll stop when he does. I'm gonna be the hand gonna be beatin' on him until he does it right.